The development of new asthma biologics and receptor blockers for the treatment of paediatric severe asthma raises challenges. It is unclear whether there are sufficient children in Europe to recruit into randomised placebo-controlled trials to establish efficacy and safety in this age group. In February 2016, the European Respiratory Society funded a clinical research collaboration entitled “Severe Paediatric Asthma Collaborative in Europe” (SPACE). We now report the SPACE protocol for a prospective pan-European observational study of paediatric severe asthma. Inclusion criteria are: 1) age 6–17 years, 2) severe asthma managed at a specialised centre for ≥6 months, 3)clinical and spirometry evidence of asthma, and 4) reaching a pre-defined treatment threshold. The exclusion criterion is the presence of conditions which mimic asthma symptoms. Eligible children will be prospectively recruited into a registry, recording demographics, comorbidities, quality of life, family history, neonatal history, smoking history, asthma background, investigations, and treatment. Follow-up will provide longitudinal data on asthma control and treatment changes. The SPACE registry, by identifying well-phenotyped children eligible for clinical trials, and the amount of overlap in eligibility criteria, will inform the design of European trials in paediatric severe asthma, and facilitate observational research where data from single centres are limited. In order to deliver new treatments to children and adolescents with severe asthma, clinical trials of new biologics and receptor blockers are needed, since data on safety and efficacy from trials in adults cannot always be appropriately extrapolated to this age group. There are however problems with performing clinical trials in children and adolescents with asthma. For example, severe asthma phenotypes are less well characterised, the severity of paediatric asthma tends to vary greatly, numbers are fewer than in adult asthma, long-term adverse effects may be more important, and children and adolescents often engage less well with complex clinical trial interventions than adults . Indeed, it is currently unclear whether the subphenotypes and putative endotypes of asthma eligible for some of the new monoclonal treatments even exist in children with severe asthma and whether there are sufficient children to support multiple trials in Europe with overlapping eligibility criteria. In 2015, the European Medicines Agency (EMA) expressed their view to officers of the Paediatric Assembly of the European Respiratory Society (ERS), that recruitment of children with asthma into trials of new biologics would be significantly enhanced if there were a network of European respiratory paediatricians able to both support recruitment and provide academic advice and guidance to the EMA and industry. In 2015, the ERS funded a clinical research collaboration (CRC), developed by members of its Paediatric Assembly (Assembly 7) to develop the evidence and structures to enable European paediatricians to identify and recruit eligible children. Funding of CRCs is a major route whereby the ERS engages in the promotion and coordination of activities in respiratory medicine by working to advance science and clinical research within a specific disease area (www.ersnet.org/research/clinical-research-collaborations). The aim of this CRC entitled “Severe Paediatric Asthma Collaborative in Europe” (SPACE) is to: 1) develop a minimum “core” eligibility criteria dataset which will identify children and adolescents with genuine severe asthma as per ERS/American Thoracic Society (ATS) taskforce guidelines, and by using this dataset, prospectively survey the number of children eligible for current and proposed trials; 2)develop a bid for a registry of eligible children to not only enhance participation in trials but also generate new insights into responsive subgroups; and 3)actively engage with children and adolescents to help understand how to better promote trial opportunities and remove barriers to involvement in therapeutic clinical trials of new severe asthma treatments. Here we report the protocol for the SPACE registry, an open, pan-European registry of paediatric patients with severe asthma. The objectives of SPACE are as follows. To develop a pan-European multicentre, prospective and observational registry of children with severe asthma, incorporating baseline and annual follow-up data. To agree upon common definitions and registry entry criteria across Europe. The registry will record the demographics, comorbidities, aetiology, treatment, resource use, exacerbations, severity and prognosis of severe paediatric asthma across Europe; providing a comprehensive real-life description of the characteristics and burden of severe paediatric asthma across Europe. To provide a database of well-phenotyped paediatric patients with true severe asthma and to develop an infrastructure to support trials of new therapies in paediatric asthma (especially biologics), aimed at increasing participation of European children in these trials, enhancing participation of ERS paediatricians, children with severe asthma and their families in the planning of future studies, and generating new academic insights into target populations. The SPACE registry is based on the successful ERS CRC for Bronchiectasis (EMBARC), a registry supported by the Health Informatics Centre (HIC) at the University of Dundee (Dundee, UK) . With their support and close liaison, the SPACE protocol was developed following thorough discussions amongst leading respiratory paediatricians from Germany, Italy, the Netherlands, Norway, Portugal, Turkey and the UK. The CRC initially set up a core group to systematically review the literature on proposed definitions of severe paediatric asthma (details on the methods of the systematic review will be reported separately). Based on the pre-selected variables and eligibility criteria, a prototype of the registry was developed. The SPACE registry will be a prospective, non-interventional, observational cohort study, with a short-term target of enrolling 7–20 patients per centre over the course of the first year. Enrolment is planned to increase with time and future funding. Study centres will be invited to participate on the basis of their ability to include patients from a severe asthma clinic or service, and a track record of contributing to clinical research. Consideration will be given to encourage investigators from under-represented parts of Europe (such as Eastern Europe) to contribute, making this a representative and truly pan-European registry. Asthma management will be according to local policies with no additional intervention from the study. The registry will thereby identify differences in practice at various European countries. Children and their parents will provide assent and consent for data collection at enrolment (detailed later in this article) and follow-up, in line with local regulations. Local principle investigators will be practising paediatric respiratory consultants in tertiary or specialised units. The initial phase is planned as a 1-year prospective survey including recruitment and data collection. This will generate data for the first cross-sectional analysis. Should future funding allow, prospective data will be collected with a follow-up phase which will comprise annual follow-ups. This will provide longitudinal data on any changes in asthma control and treatments. Enrolment and number of participating centres and countries may also expand. We designed the ethics approval (detailed later) to include any future expansion. Eligible participants are identified using the inclusion and exclusion criteria (tables 1 and 2). Parents and children will be invited to participate in the registry during routine clinical encounters and will be screened for eligibility using the inclusion and exclusion criteria defined above. If patients are eligible, they and their parents will be provided with a copy of the patient information sheet and the parent information sheet which will provide details of the registry aims and the type of clinical information collected. Children and their parents will be asked to provide written informed assent and consent following ample time to consider participation. Participants and their parents will be informed and will be required to agree to their medical records being inspected by the investigators or their delegate, if required, but understand that their confidential details will not be disclosed outside the research team, as non-identifiable data will be stored within the database. The participant will receive a copy of the consent and assent forms and a copy will be filed in their medical notes. Data will be collected on two or more occasions. 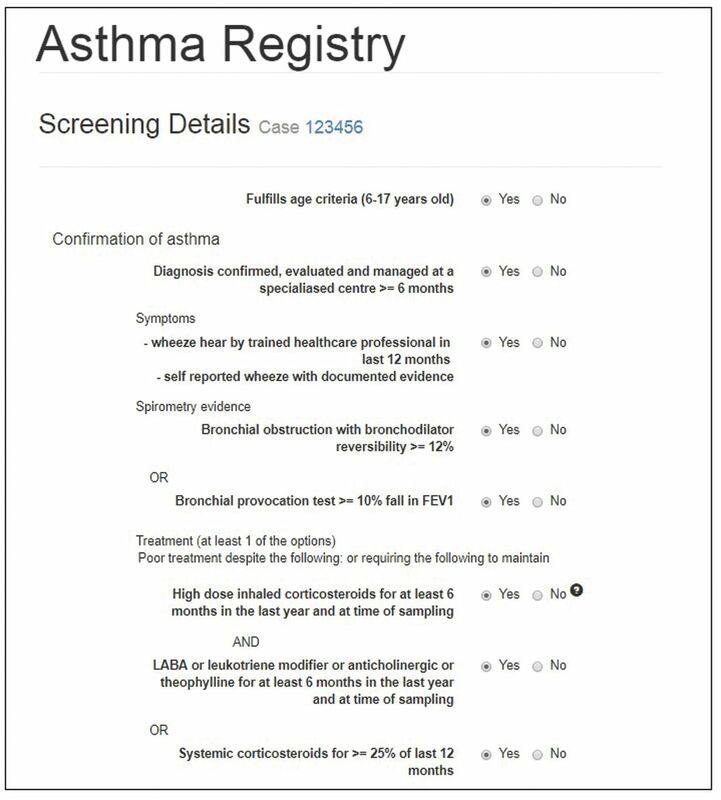 1)Case report form: the baseline dataset at enrolment, incorporating all relevant paediatric severe asthma variables. 2) Annual review form: if funding allows, follow-up data collected annually (±3 months), signifying changes in medications, exacerbations, hospital admissions and survival status. The dataset is sufficiently simple that any specialist asthma clinic will be able to provide the data. Nevertheless, the data are sufficiently robust that they will provide a comprehensive overview of all aspects of paediatric severe asthma care in Europe. The data fields were established following consultation with European stakeholders. There will be an option for participants to consent for future contact concerning participation in future clinical studies. The network will therefore aid research collaborations around Europe. Figure 1 shows part of the online data collection platform. The SPACE registry data collection platform. An adherence assessment along with data on comorbidities, risk factors for asthma, family history, neonatal history and smoking history will be recorded. The Paediatric Asthma Quality of Life Questionnaire score will be incorporated into the registry. Best and worst pre- and post-bronchodilator spirometry results in the past 6 months will be recorded. Spirometry will be performed according to the ATS/ERS standards . The Global Lung Function Initiative-2012 equations will be used to generate predicted values, lower limits of normal and z-scores for spirometric indices. The results of bronchial provocation tests, if applicable, may be recorded. The most recent results for: exhaled fractional nitric oxide; sputum and blood eosinophil counts; total IgE, specific IgE and skin prick test; radiology and bronchoscopy findings including bronchoalveolar lavage cytology and microbiology will be recorded, if available. Asthma control will be assessed by Asthma Control Questionnaire and/or Asthma Control Test scores within 4 weeks of enrolment, along with a Global Initiative for Asthma assessment. The number of exacerbations (episodes requiring systemic steroids), hospital admissions, and incidents of noninvasive or ventilatory support in the past 12 months will be documented. Total number of intensive care unit admissions and mechanical ventilation since the diagnosis of asthma will also be recorded. Details on various inhaled and oral therapies (bronchodilators, steroids, anticholinergic, leukotriene receptor antagonist, antihistamines, anti-reflux medications, theophylline, antibiotics and monoclonal antibody) will be recorded. Further details on the monoclonal antibody treatments including previous assessment, usage and reasons for discontinuation will be documented. Any adverse effect of chronic steroid use will also be noted. Treatment options will be regularly updated as new treatments become available during the study. This study received ethical approval from the London (Bloomsbury) Research Ethics Committee in the UK on February 20, 2018 (18/LO/0178). The registry was developed according to recommendations made by the EPIRARE (European Platform for Rare Disease Registries) consortium  and EUCERD on registries in the European Union . The registry is secured at the HIC at the University of Dundee. The Safe Haven model (www.scot-ship-toolkit.org.uk/information-page/ship-safe-havens) will provide anonymous registry data to researchers throughout Europe. The Safe Haven is a virtual desktop allowing for secure data access and analysis; data security is ensured by inhibition of data copying or downloading. Local data access will be unrestricted to active investigators and other stakeholders. The joint chief investigators and the steering committee have a download facility to enable quality checks and data review. Missing data will be highlighted to the investigators and a random audit will be conducted at study sites. Annual summaries of the study may be presented at conferences or used for clinical or scientific publications. Requests to access or analyse the database will be submitted to the SPACE scientific committee. The HIC database and governance processes surrounding data management and access are fully compliant with the UK Data Protection Act 1998 and the Data Protection Directive 95/46/EC of the European Parliament and of the Council (1995), and will also comply with the new EU General Data Protection Regulation from May 2018. Data sharing agreements will be established between sites and the HIC, warranting compliance with national laws on ethics and data protection. The study will be conducted in line with Good Clinical Practice. A favourable ethical opinion will be obtained, if applicable, by each site from the appropriate research ethics committee or institutional review board. All patients, or their parents for those under the age of 16 years, must provide written informed consent prior to participation. The European Lung Foundation (ELF) (www.europeanlung.org) is working with the SPACE network to ensure appropriate patient consultation across Europe. The registry and relevant documents were developed with the review and feedback from the patient advisory group. Members of the ELF and patient advisory group form part of the steering committee of the SPACE registry. With the help of ELF, patient information resources in multiple languages will be established. The proposed protocol has strengths and limitations. Its strengths are: 1) the wide range of participating specialised centres across Europe (table 3), with the capacity to provide a good representation of well-phenotyped children for future pan-European studies; 2) its close link with the ERS CRC EMBARC, which has proven to be a successful international registry and serves as a guide for the development of SPACE; 3) participation of industrial representatives (from GlaxoSmithKline and AstraZeneca via previous links with CRC members) who provided advice on the development of this registry, and are the industry links for the development of clinical trials; and 4) its link with patient organisations, the supporting documents for the registry were developed with the support of ELF and their patient advisory group, which consists of adult patients who have had severe asthma from a young age and the parents of children with severe asthma. The registry’s limitations are that: 1) the initial cross-sectional data analysis is not reflective of all major European centres managing severe asthma; 2) the lack of paediatric patient representatives and limited representation from outside northern Europe; 3) no current direct industry funding; and 4) no long term funding. The future work of SPACE will both address these limitations, and develop an analysis plan for data from the initial cross-sectional data collection. The limited number of well phenotyped children with asthma in Europe in any single clinical setting presents a challenge when developing trials of new therapies, especially biologics. SPACE has developed a protocol for a pan-European registry for paediatric severe asthma. The SPACE registry will facilitate observational research as well as identify eligible children for future clinical trials. SPACE acknowledges the contribution from ELF and the patient representatives Annette Brons, Elizabeth Davin, Betty Frankemölle, Olivia Fulton, Dominique Hamerlijnck, Toni Latimer-Simpson and Mark Stafford-Watson from the patient advisory group; Jasmine Parkinson from Asthma UK; and Giuseppe De Carlo from the European Federation of Allergy and Airways Diseases Patients’ Associations (EFA) for their help and support in the development of the SPACE registry and associated documents. The SPACE registry is based on the successful ERS EMBARC Bronchiectasis CRC – special thanks to the EMBARC team for their continued support for the development of the registry. We thank Amanda Oliver from GlaxoSmithKline and Magnus Aurivillius from AstraZeneca for their advice on the development of SPACE. The authors’ affiliations are as follows. Norrice M. Liu: Centre for Genomics and Child Health, Blizard Institute, Queen Mary University of London, London, UK. Wim van Aalderen: Dept of Paediatric Respiratory Medicine, Academic Medical Centre, Amsterdam, The Netherlands. Karin C.L. Carlsen: Dept of Paediatrics, Oslo University Hospital and University of Oslo, Oslo, Norway. Courtney Coleman: Patient Involvement and Engagement, European Lung Foundation, Sheffield, UK. James D. Chalmers: College of Medicine, University of Dundee, Ninewells Hospital and Medical School, Dundee, UK. Steve Cunningham: MRC Centre for Inflammation Research, University of Edinburgh, Queen’s Medical Research Institute, Edinburgh,UK. Ricardo M. Fernandes: Dept of Pediatrics, Hospital de Santa Maria, Lisbon, Portugal; and Laboratory of Clinical Pharmacology and Therapeutics, Instituto de Medicina Molecular, Faculdade de Medicina, Universidade de Lisboa, Lisbon, Portugal. Louise J. Fleming: National Heart and Lung Institute, Imperial College London, London, UK. Monika Gappa: Children’s Hospital and Research Institute for the Prevention of Allergies and Respiratory Diseases in Children, Marien Hospital, Wesel, Germany. Bülent Karadag: Division of Pediatric Pulmonology, Marmara University, Istanbul, Turkey. Fabio Midulla: Dept of Paediatrics, Sapienza University of Rome, Rome, Italy. Marielle W.H. Pijnenburg: Dept of Pediatrics, Division of Pediatric Pulmonology, Erasmus MC-Sophia Children’s Hospital, Erasmus University Medical Centre, Rotterdam, The Netherlands. Niels W. Rutjes: Dept of Paediatric Respiratory Medicine, Academic Medical Centre, Amsterdam, The Netherlands. Franca Rusconi: Epidemiology Unit, Anna Meyer Children’s University Hospital, Florence, Italy. Jonathan Grigg: Centre for Genomics and Child Health, Blizard Institute, Queen Mary University of London, London, UK. Author contributions F. Rusconi and J. Grigg are joint chief investigators and principal applicants for this CRC project. R.M. Fernandes, B. Karadag, M.W.H. Pijnenburg and F. Rusconi performed the literature review for registry entry criteria. J.D. Chalmers facilitated the liaison with HIC at University of Dundee. All other authors contributed equally to the design and implementation of the registry. Conflict of interest: N.M. Liu has nothing to disclose. Conflict of interest: W. van Aalderen has nothing to disclose. Conflict of interest: K.C.L. Carlsen has received financial support from governmental and other bodies for studies not related to the present project, andhas no conflict of interest to declare. Conflict of interest: C. Coleman is an employee of the European Lung Foundation. Conflict of interest: J.D. Chalmers reports grants and personal fees from Glaxosmithkline (research grants for COPD), Boehringer-Ingelheim (research grants for COPD studies), Pfizer (research grants for COPD), Bayer Healthcare (research into bronchiectasis) and Grifols (research into bronchiectasis); grants from AstraZeneca (research grants for COPD); personal fees from Napp (for consulting), outside the submitted work. Conflict of interest: S. Cunningham has nothing to disclose. Conflict of interest: R.M. Fernandes has nothing to disclose. Conflict of interest: L.J. Fleming reports other from Novartis (lecture fees and advisory board fees paid to her institution), Vectura (consultancy fees, paid to her institution), Boehringer Ingelheim (advisory board fees, paid to her institution) and AstraZeneca (lecture fees paid to her institution), outside the submitted work. Conflict of interest: M. Gappa reports personal fees from GSK (advisory board), Boehringer (advisory board and speaker honorarium) and Novartis (advisory board and speaker honorarium), outside the submitted work. Conflict of interest: B. Karadag has nothing to disclose. Conflict of interest: M.W.H. Pijnenburg has nothing to disclose. Conflict of interest: N.W. Rutjes has nothing to disclose. Conflict of interest: F.Rusconi has nothing to disclose. Conflict of interest: J. Grigg reports personal fees (honorarium for advisory board) from GSK and Vifor Pharmaceuticals, outside the submitted work. Support statement SPACE is a clinical research collaboration (CRC) project funded by the European Respiratory Society.
. Clinical trials in children. Br J Clin Pharmacol 2015; 79: 357–369. The EMBARC European Bronchiectasis Registry: protocol for an international observational study. ERJ Open Res, 2016; 2: 00081-2015. Guidelines for data sources and quality for RD registries in Europe. WP 7 deliverable EPIRARE project, 2014. www.epirare.eu/_down/del/D4_GuidelinesfordatasourcesandqualityforRDRegistriesinEurope.pdf Date last updated: February 28, 2014.
. Patient registries in the field of rare diseases. www.eucerd.eu/?post_type=document&p=1218 Date last updated: June, 2011.